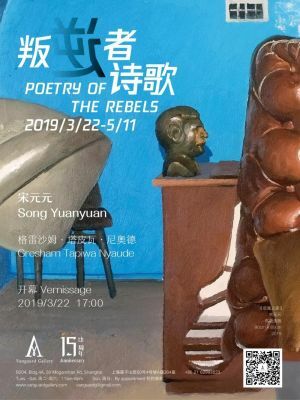 Vanguard Gallery is glad to announce the duoexhibition of Gresham Tapiwa Nyaude and Song Yuanyuan Poetry of the Rebels isopening on March 22nd. The exhibition will last until May 11th. Born and raised in Mbare, Nyaude works against thesweeping identity that has been defined by the voice of the state. His imagesoscillate between figuration, abstraction and hallucination, drawing from therestless energy of the ghetto. Mbare is Harare’s and perhaps Zimbabwe’s most vibrantand notorious ghetto. Allegedly ridden with hooliganism, violence andprostitution, Mbare is said to parallel the conditions of Harare forZimbabweans during the colonial segregation era (in respect of its hardship andquality of living space). To this day Mbare retains the character of a portcity with its trade, shady deals and otherwise bustle of unremitting humantraffic amid urban decay. Living on the verge between survival anddemise has been somewhat of a call to poetry, at times proving brutal andat others sentimental or cynically satirical. Gresham’s figures defycharacterization, underscored by the humanity of their quest to attain aquality of life that appears even beyond the reach of dreams. Song Yuanyuan’s paintings seemingly depicted mundane surroundings andobjects yet they were all settled in an unsettling way. As if there is avicious gaze peeping the darkest side deep in your soul in Schadenfreude as youare gazing the painting, the feeling of being disposed forces you to hide awayand self-inspect. Borrowed online images and photographs taken in daily life asinspirations, Song Yuanyuan has abandoned narrativity in his paintings andtrying to depict a sense of emotion through collaging objects. Ordinary objectsand grotesque environments, often enclosure spaces with only artificiallighting, formed Song Yuanyuan’s artistic language. His works embody thedesire and lure for reality and illusion and the contradictions, which thejuxtaposition of these two might create. The conflict between his artisticideals and the reality becomes an intense yet poetic battle presented oncanvas. They are the rebels of reality, calling the poetryof dreams.